Since no one seems to have coined the term yet, I will go ahead and do so: Moononomics. These are the economic policies of South Korean President Moon Jae-in. Given that his presidency has recently passed the one-year mark, it is time to see what progress has been made. As outlined in Moon’s campaign promises, the current administration wishes to target a number of areas for reform. Most notable among these are expansion of public sector jobs and increases in the minimum wage. First, some context. One of the main tenants behind Moononomics is recognition of the fact that average Korean households have accumulated very high levels of debt while at the same time incomes in the last three years have stagnated. This has created a difficult situation in which many households (and small businesses) have struggled to pay back their loans. As I and others have documented, South Korea’s current debt structure is one with many interdependencies. This means that an inability in one subsection of society to repay its debt has the potential to spark serious repercussions across the entire Korean financial system. In short, it is important that average Koreans are given the ability to pay off their debts. The Moon administration has decided that the solution is to boost domestic consumption by increasing wages and developing homegrown jobs untied to income from exports. Although this strategy does buck the current global trend, there are many reasons to believe it can work. So what has the Moon administration actually done so far? Immediately after inauguration, a supplementary budget was passed in June 2017, adding funds for the creation of about 63,000 public sector jobs. The original budget proposal called for the creation of 71,000 but this figure was reduced after negotiations in the National Assembly as Moon’s party only holds 39 percent of seats. 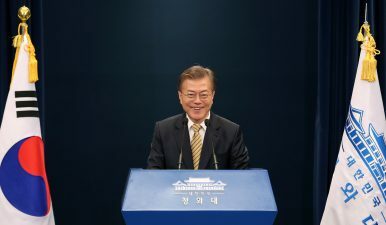 The June budget was the first step in meeting Moon’s campaign promise of creating 810,000 public sector jobs by the end of his term. The June supplement was followed shortly by a budget proposal for the 2018 fiscal year. This proposal, submitted to the National Assembly in 2017, set a target of creating 174,000 more public sector jobs by 2022 with 12,221 of them slated for 2018. After negotiations, this number was again reduced to 9,475 and approved in December of 2017. Also approved in 2017 was the first minimum wage hike: an increase of 16 percent from year to year. Given the high popularity of the minimum wage policy during the presidential election, the 2017 increase was not contested by lawmakers, setting up future showdowns for the subsequent annual increases desired by the Moon administration. So what impact have these reforms had so far? For context, it is important to note that Korea had a little over a million public sector employees in 2016. Compared to other OECD countries, this is actually quite a low number. As a percentage, public sector jobs (including contract positions) only make up about 10 percent of all jobs in Korea, less than half the OECD average. Closing this gap is another reason why the Moon administration has been so eager to expand the public sector. With these numbers in hand, it becomes apparent that the 72,000 jobs being added through the supplemental and 2018 budgets is actually quite significant, an increase of over 5 percent from year to year. What then of overall employment rates? In March, Korea recorded its highest unemployment rate in eight years. And although critics have been quick to blame the minimum wage hike, a closer analysis reveals that a number of factors have already been moving this number since last year. The first is a cooling off of high employment in construction that peaked last year. A second has been the continuing decline of workers in the auto and ship building industries. One of the metrics Moon administration critics have been particularly eager to tout as evidence against minimum wage increases has been the slow loss of jobs in retail, accommodation, and food service. Here too, a closer examination reveals a more nuanced picture with two main parameters appearing influential. The first is the uneven resumption of Chinese tourism in Korea, which bounced back briefly at the end of last year but has remained sluggish throughout 2018. A recent analysis by the Korea Institute of Finance argued that recent job loss patterns are not indicative of firings due to high labor costs but instead due to the natural cycle of business closures, something not currently being compensated for by a concurrent opening of new businesses. An important and very unexpected development accompanying the minimum wage increase has been the advent of compulsory holidays implemented by employers. These holidays have become a common device to ensure that the pay of employees paid through an annual salary system conforms to the new minimum wage. Instead of raising salaries to meet the new standards, a large number of companies and organizations such as universities have instituted compulsory holidays to reduce the number of workdays. Many workers have complained this makes their jobs harder because the amount of the actual work they need to do remains unchanged despite now having less time to do it. With the Moon administration’s recent push to reduce average work hours, it remains unclear whether additional legislation will be proposed to address this issue. Another dilution of the minimum wage increase was approved last week, with the National Assembly adjusting minimum wage requirements to accommodate bonuses and benefits, allowing these to be counted towards salary in certain situations. This is despite new data showing that the income gap has continued to widen since Moon took office, motivating some to call for an acceleration of reform policies. Although the data as a whole so far does not justify panic that wage increases are hurting the economy in any significant way, there are still many concerns for backlash against future implementations. The various political parties are looking ahead to the upcoming local elections as a critical indicator of whether new Moononomics policies will be approved. Given the early stages of this important economic experiment, it may be that failing to follow through is actually more dangerous than quitting halfway. It remains to be seen whether the public will share the conviction of their president and provide a renewed mandate through their vote.